An attractive Coral & White Dupioni Check Ribbon with a Matching Thread Wire Edge. Use this Wire Edge Ribbon to create fun ribbon crafts & bows! 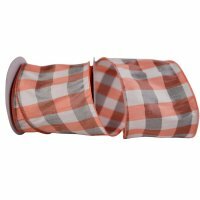 The Ribbon Diva offers a large selection of Everyday Check Ribbons in different widths, colors, and styles.